The Philippines has continued to win countless accolades, titles, and placements in pageantry for 2015. One of which is the World Championships of Performing Arts Male Model of the World, which was won by Mister Philippines 2015 Mike Gerard Mendoza. This year, in media partnership with ABS-CBN, and in collaboration with Pilipinas Men’s Fashion and Fashion Institute of the Philippines, Mister Philippines organization is proud to announce and present its 7th year staging. Finals Night will be held on April 14, 2016 at Tanghalang Pasigueño in Pasig City. Mister Philippines is an annual search for eligible bachelor Filipinos to represent our country abroad that epitomize the Patriotic, Educated and Fit character of Philippine manhood, and a true Gentlemen of Goodwill. The organization made extra effort to search for the next batch of deserving men doing the grueling task to do the screening nationwide which was made possible with the help of the regional partner hosts from Quezon City, Pasig City, Pangasinan, Nueva Ecija, Pampanga, Baguio, Iloio, Davao and Manila. Mister Philippines has chosen the twenty-four (24) official candidates. The organization has programmed a series of pocket events to challenge their different abilities. The two weeks of intense competition begins in Subic on April 1-3 where a 3 day sports challenge awaits our courageous men. This is to be followed by the Festival Costume Competition hosted by the Local Government of Lobo, in Batangas on April 4. To test their ability to work in a team, Crystal Waves Hotel & Resort prepared a team building challenge to inspire them with the spirit of “Bayanihan” scheduled on April 5 & 6. The Preliminary Competition on April 10 will be hosted by Systems Plus College Foundation in Pampanga. A Gala night fashion show event at The House Manila of Resorts World is also in line for the candidates before the much awaited Proclamation Night on April 14 at the Tanghalang Pasigueño, Pasig City where 4 lucky gentlemen will be announced victorious amongst the 24. 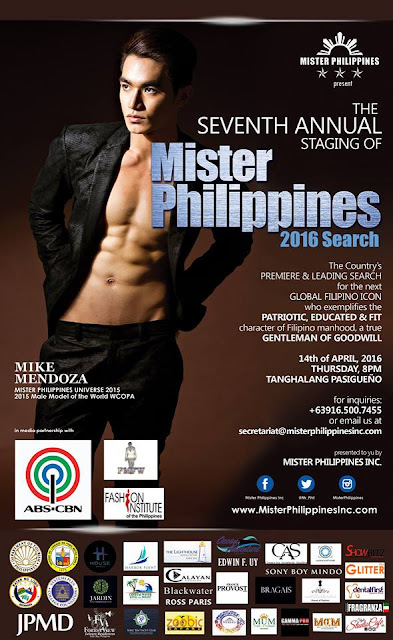 Established by its founder and current president Dr. Joseph Pallera in 2010, Mister Philippines, Inc. is the SEC-registered national presenter of Mister Philippines, the premiere annual male personality competition in the Philippines. Mister Philippines titleholders represent our country in international male pageants. Past Mister Philippines title holders are Raphael Cruz Carlos (2010), Fhrancis Oliver Lopez (2011), Mark John Gutoman (2012), William Pagayon (Universe 2013), Mark Del Rosario (Universe 2014), Rickson Logaspi (Tourism 2014), Richard Mojado (Planet 2014), Gio Cabanlit (Tourism 2015) and Mike Gerard Mendoza (2015). FB Page: Mister Philippines Inc.